If firefighting is something you would like to do after high school, then be aware of the following steps. These will help you become a firefighter. These steps contain in-detail information on educational, training and licensure requirements for firefighters. The good news is that you don’t need a college degree to become a firefighter. However, a college degree will help you in career advancement. Let’s assume that you are interested in becoming an entry-level firefighter. All it requires is a high school diploma or GED. But be mindful of the fact that firefighter’s jobs are growing at the rate of 7% from 2016 to 2026. Due to this, you should stand out amongst your peers and a college degree might just be the thing to do that. Consider taking college-level courses in fire science, or a related subject. In addition, consider getting CPR and first aid certified. Training in emergency medical services will make you a suitable candidate since firefighters regularly rescue victims in burning buildings and may be required to provide first aid to them. 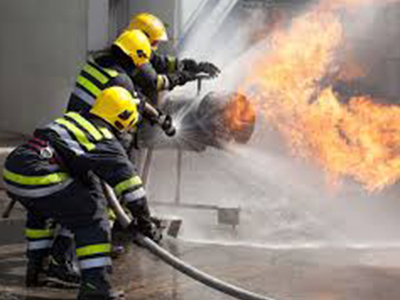 Fire academies are run by fire departments or state governments. There is no national curriculum and therefore each follows its own training program. Entry-level firefighters training duration will therefore vary from academy to academy. However it is likely that you will spend a few months of training at your fire academy. The training program will be based on both in class learning and on the field exercises. You will be taught firefighting and prevention techniques, local building codes and emergency medical procedures. Furthermore, you will be taught how to fight fire with axes, ladders, fire extinguishers and chain saws. Once you have graduated, you’ll serve your probationary period. In addition to fire departments run by county and state governments, there is a federally funded training program run by the National Fire Academy as well. Firefighters are sent to attend this program to learn anti-arson techniques, hazardous materials control, disaster preparedness and public fire safety and education. As mentioned earlier, if you have a background in emergency medical services, you can brighten your chances of getting hired. This is because recruits get certified as emergency medical technicians (EMTs) at the academy. Some fire departments may also require their recruits to become paramedics. And though for now you can ignore this information but in case you are wondering what it takes to excel in this field and get promoted on regular basis then remember that you can go up to battalion chief level without a college degree. But beyond this level, you would be required to complete a 4-year degree. In case if you have ever dreamt of becoming a fire chief then know that it may take you as long as 20 years to become one. You may either be appointed as the fire chief or get elected to the position.